We've taken the hassle out of searching for big plastic toy farm animals by compiling a top 10 list of makers for sale in the UK. If you a have little one in to farm toys then you might by familiar with a few names in the list mentioned, but making the right choice in the first place is the key. Its important to get them started out in life with trusted brand names in toy farm animals to insure good quality in a long list of options to you. This includes toy farm animals ranging from cows, pigs, sheep, chickens and all the animals you'll expect to find on the farm. Look out for plastic animals with a little flexibility to prevent breakage. Quality is shown in the craftsmanship and this is visible on the hand painted models where the lesser figures are just moulded plastic with just a lick of paint or none at all. Big farm animals vary from size tremendously between makers, but you will get a choice to mix and match from some brands with very little difference. But it's very important to stick with the size (or scale) you've started out with so everything fits and comes together when buying accessories later on. You will increase your choices or limit your options as the child's interest and collection grows bigger over time. If you want to add to the set once in a while the more expensive brands are the best option, but if you need a one off toy farm animal set then go with quality all-in-on sets. Let's take a look at our list of brands to help you make an informed decision based on our advice. Box set of Schleich farm animals including a donkey foal, sheep, chicken and black and white Holstein cow. 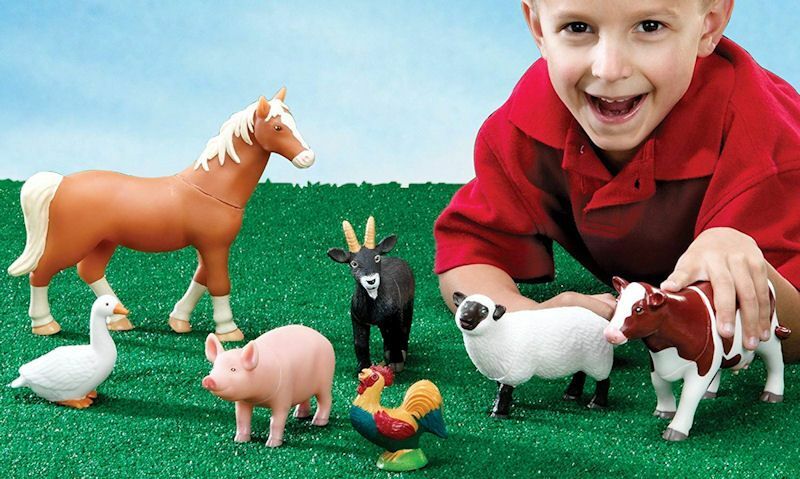 Schleich demonstrate excellence when it comes to their farm animal range and beat the competitors by a mile. They're made in Tunisia but attention to detail from their painters show real skill and effort. 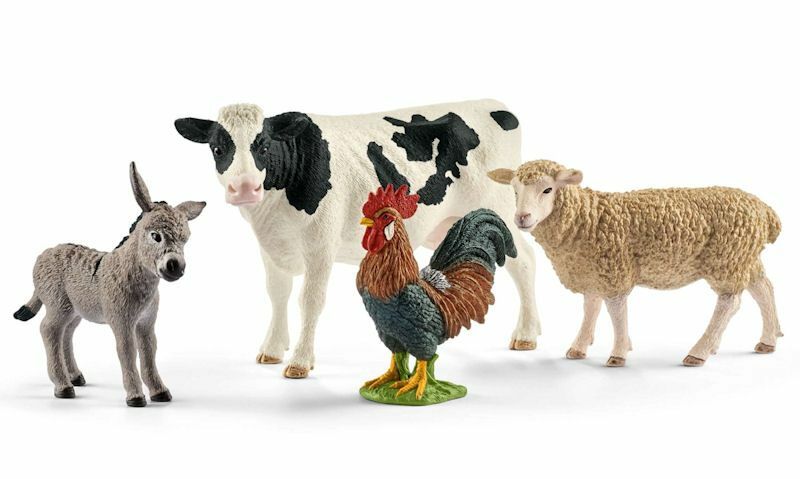 The Schleich Farm range is where you'll find these figures that boost more than thirty-seven individual farm animals and box sets with new releases every year. There's no official scale size, but many sources put them at 1:24 like Bullyland. Best suited to ELC, Branching Out and Le Toy Van farm set. Where to find or buy them? Mostly online at Amazon.co.uk, and so do smythstoys.com. 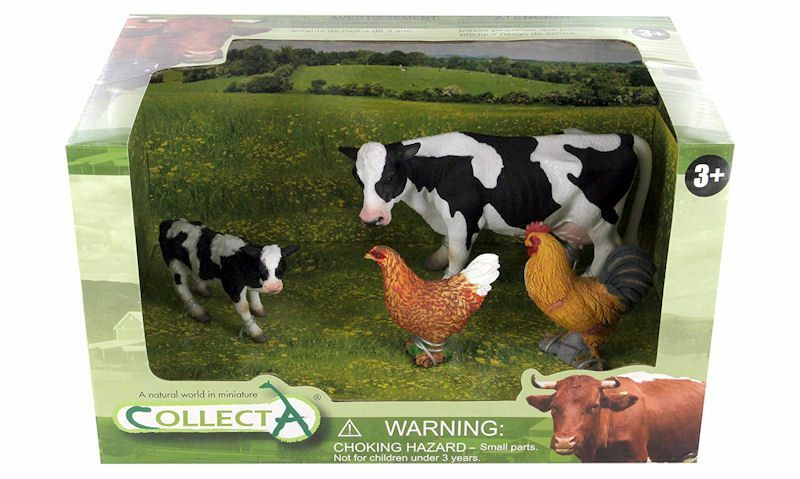 Open window box Collecta Farmyard animals includes a cow with calf and a set of chickens. Well only known to a few, Collecta actually produce one of the best big toy farm animals on the market. And well they might not be as popular as Schleich or similar brands, they are a real gem once you take the plunge. They offer boxed and sold separately figures with no retail packaging. 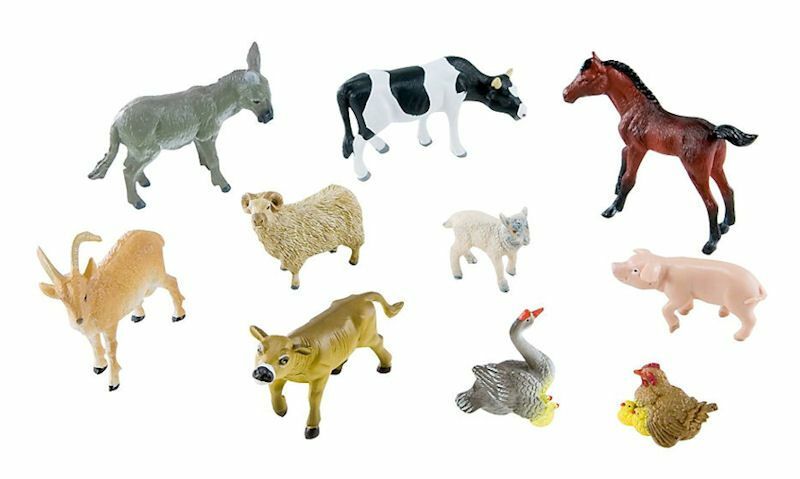 Collecta offer more than sixty-five individual farm animals in their range and are a similar size to Safari farm and Papo. Where to find or buy them? Amazon.co.uk is your first stop, with Collecta not widely sold in retail shops at this time. 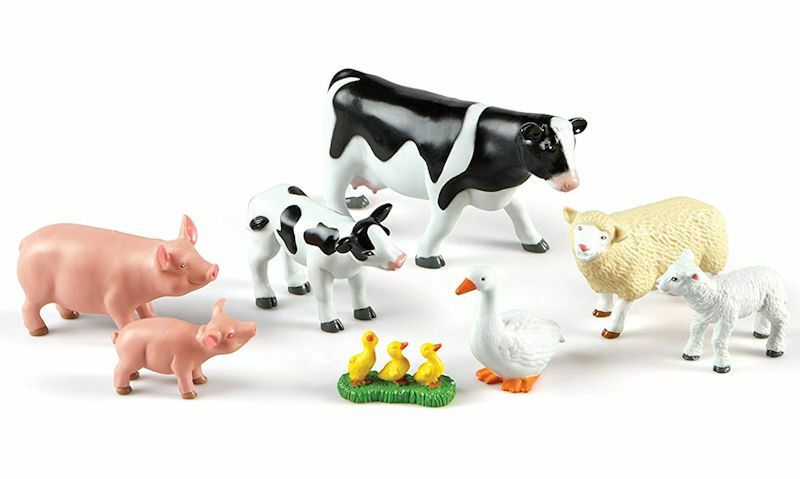 Farmyard animal families in this set including a sheep and lamb, pig and piglet. A French toy company, but made in China Papo, actually make a beautiful range of farm animals and perhaps best suited to Collecta or Safari Ltd. The 'Farmyard Friends' collection displays great craftsmanship in the paint work and play value is improved with accessories ranging from vehicles and animal transport - including farm buildings. 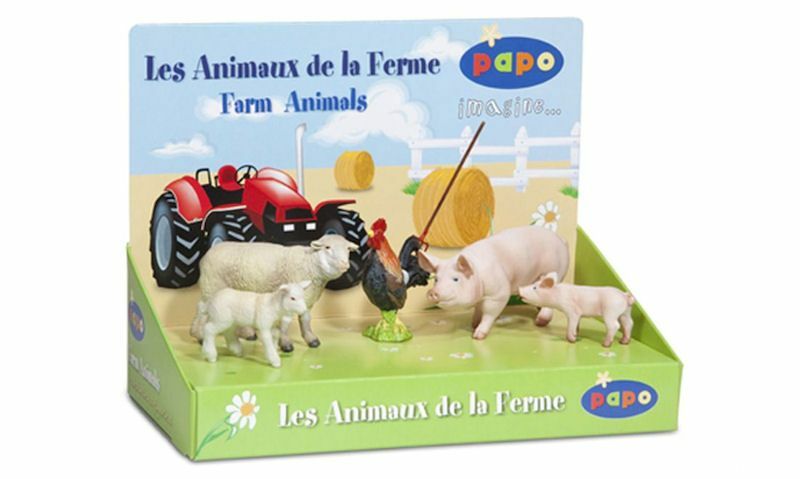 As usual, Papo's own big farm animals are made from plastic and come in singles, or box sets. Where to find or buy them? What lets Papo down most is the availability of their range on the high street, but they are widely available online. Check out Amazon.co.uk or Wonderland Models for a full selection. Bullyland farm animals like this black and white cow are usually sold separately, well similar brands will sell farm animals as box sets. German farm toy makers do it well, and there's no exception with Bullyland toys. In a similar size to Schleich and unofficially announced as 1:24 scale, but lesser quality, the range do bring there own style partially with delightful character names and friendly faces. Bullyland Farmland selection includes twenty-six farm animals with buildings and accessories to expand the set. Where to find or buy them? Available from Amazon.co.uk. 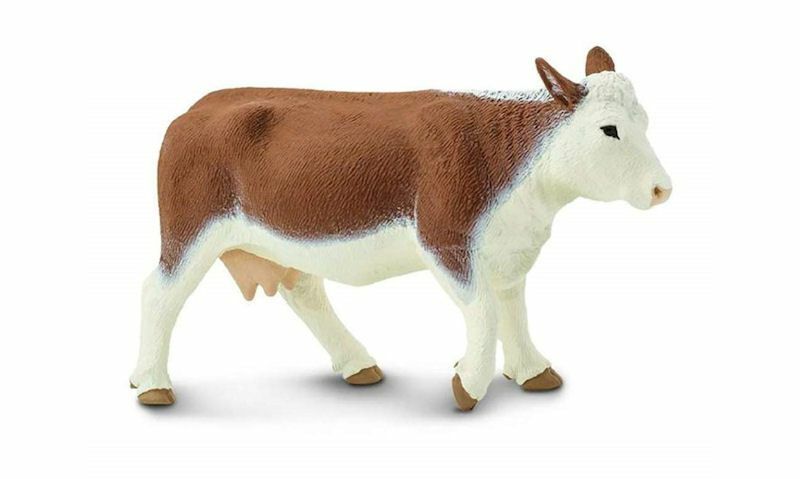 Safari Ltd do have a few box sets available, but you can build a farm animal collection as you choose, starting with this detailed brown and white cow. Well Safari Ltd should be credited for their quality in hand painted toy farm animal figurines, but unfortunately they do loose ground from their competitors as the bending doesn't hold so well and delicate plastic bits are prone to snapping. Having said that, Safari Ltd farm know their stuff. They produce a range close to Collecta and Papo sizes and feature forty-one models when you exclude the vast range of horses, cats and dog figures available. Where to find or buy them? You'll have to look further with Safari Ltd in the UK but they do exist. Try Amazon.co.uk or do a search on eBay. Britains Big Farm animals have never been available as a stand-alone figure, instead you'll find them sold with there farm vehicles and trailers. 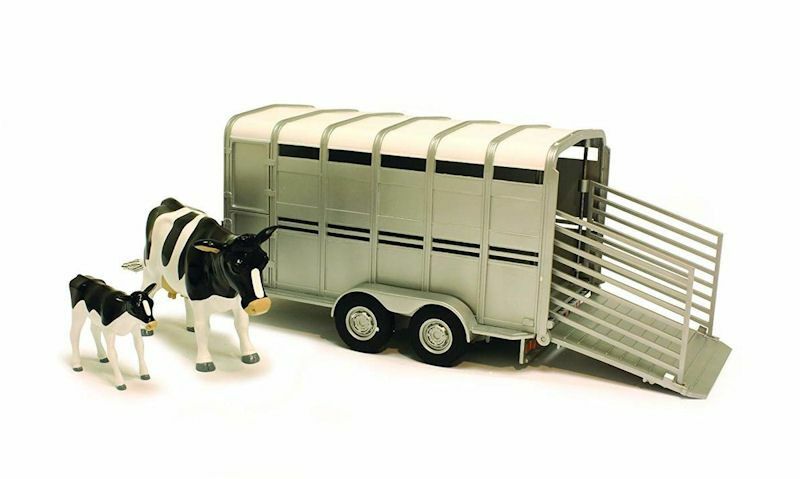 If you want to get your hands on Britains Big Farm animals then you'll need to buy the corresponding trailer or accessories is comes with. For example the cows and pigs come with trailers, and the sheep come with hurdles. But at least you known it comes in 1:16 and all matches beautifully. Britains Big Farm animals also match the Bruder Pro 1:16 range. Where to find or buy them? Find them everywhere including online to high street department stores, toy stores and local model shops. Early Learning Centre contumely release wooden farm sets so its only natural for them to supply customers a handful of big chunky plastic toy farm animals too. As you can imagine, as we move further down the top 10 list comes cheaper to buy, less quality toys. Although ELC sell hugely popular farm toy animals, not much effort as gone into there final appearance and look poor compared to the better brands. But they do a better job than other cheap brands at the lower price range. Where to find or buy them? Be sure to visit Early Learning Centre directly at elc.co.uk, or you might find a better deal at Mothercare or Debenhams. Much bigger farm animals than all features on this page features, these big, soft figures are a welcome sight to the carpet farmer. Actually for a cheaper brand, Learning Resources don't do a bad job when it comes to big toy farm animals, but let down with quality. The quick paint job is clearly visible and large noticeable cracks where their animals are assembled from head to body looks rather tacky. Where to find or buy them? You can buy directly from them at LearningResources.co.uk, or Amazon Marketplace. Here are to brown Bruder cows in different poses, through its normal to receive a Bruder bull if your were expecting a cow, so do make an enquiry first. Bruder are a well-known German toy manufacturer of replica plastic toy vehicles almost exclusively, with a few additional accessories included. 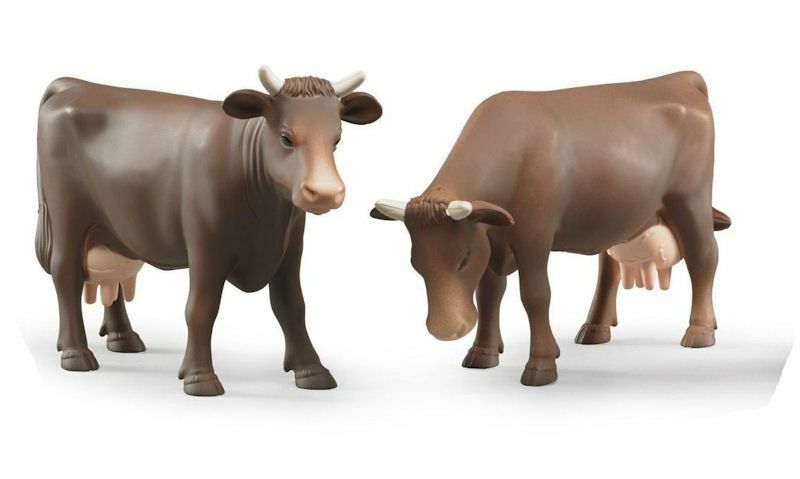 And this includes an handful of toy farm animals in cows - or bulls - only, so if they've built up a 1:16 scale farm, then look to Bruder for there cow or bull toys. Currently a range stand with brown cows or bulls, but its not difficult to dig deeper to find their black and white toy cows. Having said that, these 1:16 scale cows or bulls are compatible with the complete Bruder Agriculture range, and will fit with the Britains Big Farm series. Where to find or buy them? Bruder are widely available in the UK. Amazon.co.uk has the best offers, well the high street only supply a limited number of models. Halsall (HTI) should be credited for their incredibly cheap plastic farm animals but the quality is disappointing. Build up a quick and easy farm set with HTI but remember the painted job is quick and the quality of the plastic is not so tough during play. If HTI commit a bit more time to detail than they won't find themselves at the bottom of the top ten list. Where to find or buy them? Look out for the HTI brand in pound shops, cheap toy shops and of course online such as Amazon.co.uk or eBay.co.uk. Mojo comes to the big toy farm animal game quite late but deliver a beautiful range of figures. Better still unlike their closest competitors they have a good selection of British breeds available which is a boost to the farm industry and realistic farm play here in the UK. 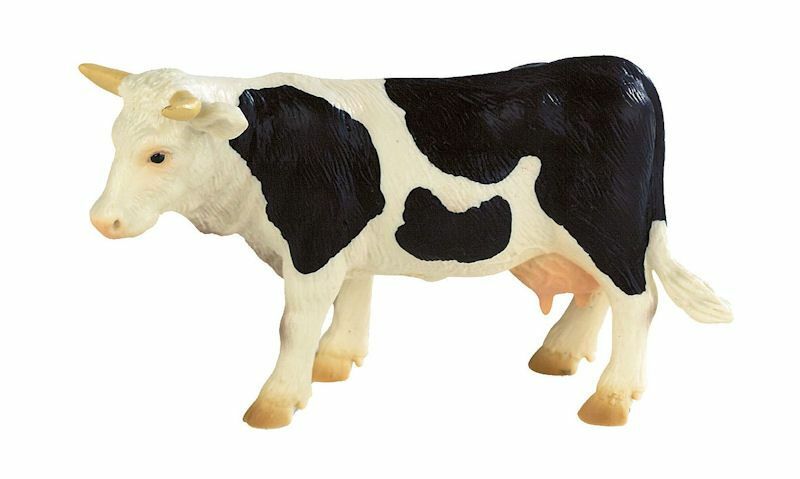 Mojo farm animals are painted with amazing detail and come in sizes close to Collecta and Safari. Where to find or buy them? Their range is available from few retailers but you can always rely on Amazon.co.uk. Need a few more brands? So there you have it, our 10 ten makers of big farm animals. But we should mention it's important to known there are plenty of more brands out there who make big farm figures. They include; Kids Globe Farming, Wild Republic, Kandy Toys, Wing Crown, and Peterkin.